My boy is 6 today! Pebbles 2010 - 2011 Design Team! Hey everyone! The August gallery is live over at Scarlet Lime. If you like retro you'll love this month's kit named "Retrophide" after a set of digital papers by Jesse Edwards printed with exclusive permission by Scarlet Lime for this month's kit. My first layout with is all about my boys and their Mimi (my mom). My boys have such a special relationship with their Mimi and I took the opportunity to document it with this month's kit. I decided to keep the journaling private so I created this cute little file folder using my Cricut and an svg file I found on the internet, printed my journaling on the reverse side of the patterned paper, and secured it with a tiny glue dot to the back of this sweet heart metal clip from Basic Grey. And just a quick image of my titlework. These chipboard letters from Cosmo Cricket are the perfect size and I loved that I could use the long arrow to ground my title. For my next layout I decided to scrap some photos of my cutie patootie nephew Eli that I snapped while we were vacationing with my sister's family down in Ocean City, NJ a few weeks ago. Isn't he just a doll? And it just so happens that his bathing suit matched the colors in the plaid paper in this kit perfectly (and no that was not planned! LOL). I wanted this layout to have a really whimsical feel to it so I first added a little mist to my vanilla cardstock background before laying down my patterned papers. I created a sun for my layout with a circle punch and just strips of yellow patterend paper cut to varying lengths. One of the patterned papers had a banner border on the reverse so I cut out a few of the "flags" and used them as part of my title work. Yes, my little nephew is quite the beach babe! 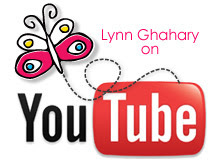 These are fabulous, Lynn!!! As always!! :) I love the whimsy feel to the one with your nephew. The one of your mom and the boys is just beautiful!! ...colors, design.. great photos!! goodness Lynn! These are both fantastic!!! What great colors and I love any CC letters...love!!!! Both of this are fabulous! You are so great at details, and beautiful photos!!! These pages are so very cute! Love that big sunshine! Fabulous layouts and great details! I especially love the photos in that first one! Love these Lynn! Love the photos on the first layout! these are both awesome, lynn!! love the sun on the beach layout and those photos of your boys and your mom are so sweet! 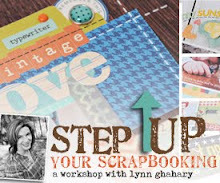 These layouts are gorgeous - I love how you layer shapes, Lynn. It adds such a huge amount of depth to your pages. Beautiful! adorable! that little banner on the second one is just cute cute! Beautiful and cute pages, Lynn. I always enjoy your pages. You have a wonderful style. 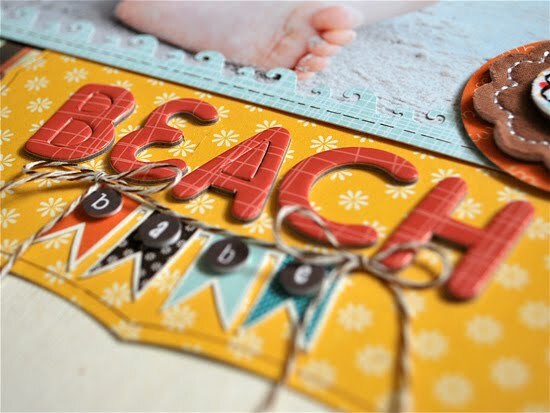 Your beach layout is oh so adorable! The big photo is just the cutest! Love the sun and the orange. 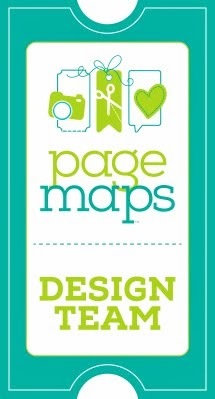 Love your pages, Lynn! So fun to see you at Scarlet Lime every month! love seeing your mom on a layout ... you look so much like her! 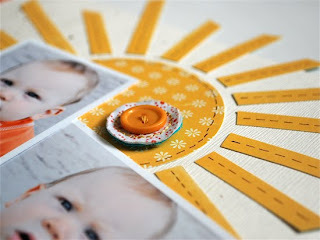 and the layout with your nephew is so fun ... he did match perfectly to the papers, and that sun is so cute!